A swift click of the lens and a moment in time is forever immortalized. It tells a story, but telling the full story is a tall order for a single second, frozen in time. CHANGING WITH THE TIMES: Workers in Bangladesh build up embankments and make the river bed lower in response to climate change raising sea levels in the digital composite image 'Building Up The Embankment Along The Kholpetua River' by Carrie and Eric Tomberlin. On average, images in the couple’s series on climate change are a product of about 70 different photos fused together to give the viewer a broader understanding. Recognizing that the real story is more complicated than that, photographers and husband-and-wife team Eric and Carrie Tomberlin decided to take a different approach to telling a visual story when they teamed up for their first ever artistic collaboration two years ago. In the summer of 2014 they traveled to Bangladesh to capture how the people there have adapted to climate change. Instead of taking just one image to represent a stretch of time, the pair layered some 70 images at a time to create digital composites that give a broader perspective. “We’re interested in having the images speak to more than just that situation,” Eric said. The North Carolina-based couple’s work is currently on display at the San Luis Obispo Museum of Art as part of the Blue Marble exhibit, which focuses on all things related to planet Earth. Looking at the striking images of people in Bangladesh doing things like working to build up the banks along a river, the average eye would never guess that they were seeing more than one photo, thanks in part to the documentarian-like approach the Tomberlins take. Separately, Eric and Carrie are each driven to focus their work on social issues like animal rights, ageism, and environmental issues. The two met at a conference for photo educators in 2005 and they both currently teach at the University of North Carolina at Asheville. 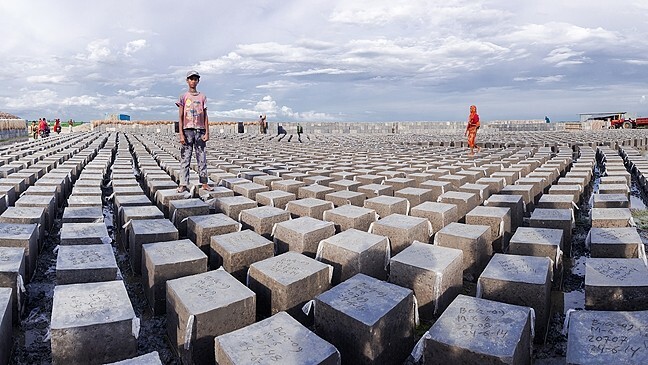 MORE THAN MEETS THE EYE: Concrete blocks are made locally in Bangladesh to reinforce embankments. 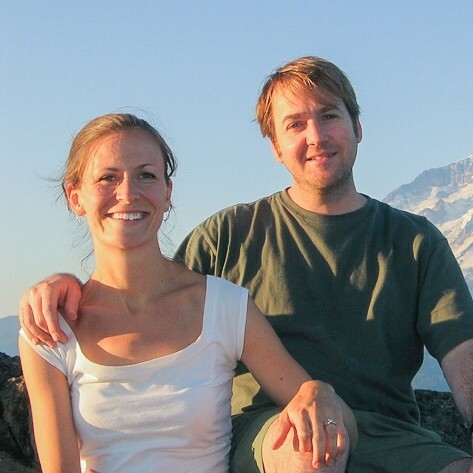 Husband-and wife-photographer team Eric and Carrie Tomberlin traveled there in the summer of 2014 to see how people there have adapted to climate change. “For us it’s about trying to contribute to some kind of conversation to make a difference,” Eric said. “Climate change impacts everyone, so that seems like a valuable thing to spend time on,” Carrie added. The duo chose Bangladesh for their current project since most of the country is at sea level. They came to the idea of folding many photos into one image when they would go out and shoot photos together. They found that some of their best work came when one person was shooting while the other was directing on scene. During their time in Bangladesh, the Tomberlins observed how the country’s residents respond when a cyclone (which happens every few years) brings sea water onto flat deltas and ruins rice fields. Farmers would then switch that field over to focus on shrimp or fish farming. The couple watched as humans instead of machines moved heavy mounds of dirt and concrete blocks to build and reinforce embankments along the river. PHOTO-ACTVISTS: Carrie and Eric Tomberlin, photographers based in North Carolina, tend to focus their artistic endeavors around social justice. Their photos on climate change in Bangladesh are currently on display at the San Luis Obispo Museum of Art as part of the Blue Marble exhibit. “They’re sort of taking what comes and carving out a lifestyle that works,” Eric said. “We thought it was important to show that there are problems, but also there are solutions,” Carrie said. Ryah Cooley is eyeballing rising sea levels at rcooley@newtimesslo.com. EARTH TO SLO: The Blue Marble exhibit, with works focusing on all things related to planet Earth, will be on display at the San Luis Obispo Museum of Art through July 31. For more information, visit sloma.org. To learn more about the works of Carrie and Eric Tomberlin, visit carrietomberlin.com and erictomberlin.com.